Josh “Sloth” Vogel is a Team Balance black belt and author of The Sloth Report, a premium BJJ newsletter devoted to in-depth technical analysis and instruction. In his instructional debut, Josh showcases the thorough and accessible instructional style that forged his reputation as a teacher. 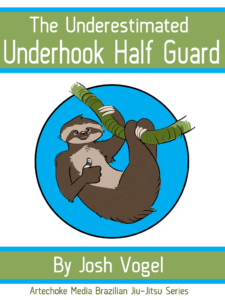 Through his underhook half guard system, Josh takes a fundamental position and explores its use with unprecedented depth, giving you a complete strategy for half guard and a roadmap for taking your half guard game from white belt to black belt. The Artechoke Media Cloud Instructional format gives you a unique learning experience: see the technique in motion from every angle, read in-depth explanations of strategy and tactics, then watch the material taught on video. New to the Artechoke Media Cloud Instructionals? Enjoy the first chapter as a free sample to see how we’re revolutionizing BJJ instructionals.